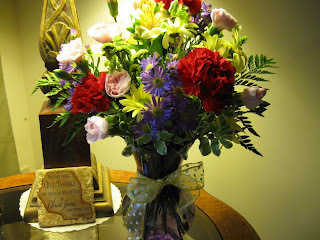 I wanted to share this lovely bouquet of flowers that was brought to my door this afternoon. My dear friend Maggie sent these to me for my birthday.....they are so Beautiful and Maggie is an absolute doll to think of me. I know we all talk about our friendships here in blogland that we have found, and I know we appreciate each other very much. My life has changed so much in the last 9 years. I have had many surgeries and things going wrong physically which limited me quite a bit. Since 2003 I have not been able to drive anymore and that in itself was a big blow to me. I inherited a rare disease of the corneas in which I have had multiple surgeries for over the years, hence no more driving.